This was a book club selection that I nominated. It won the Booker Prize in 1999, and four years later Coetzee won the Nobel Prize for Literature. 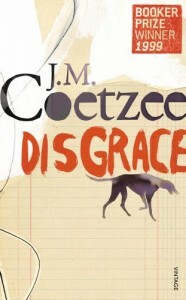 Disgrace takes place in South Africa, and the protagonist (David Lurie) is a man who loses his job as a professor because of a brief affair with a student. He goes to live with his estranged daughter on her farm in the Eastern Cape. The conflicts within the novel center around David’s complicated relationships with the varied women in his life – a prostitute, the student, his daughter, an ex-wife, a friend of his daughter’s. This is a dark story, and has scenes that may be hard for animal lovers to read. Whether or not David shows any growth in the story is up for debate. This brief book is not short on discussion, and just a little planning will ensure meaningful discussion for book clubs. It was just last year that I read The Great Santini. I’ve read most of what Conroy has written (The Prince of Tides being one of my all-time favorite novels) and his cannon is brief enough that I can easily read it all. I decided that I would after reading My Reading Life in 2011. When I finished The Great Santini, I didn’t love it. I love Conroy’s writing, but I couldn’t imagine a man who was that horrible but whose child still tolerated him enough to endure the memories enough to write about him. 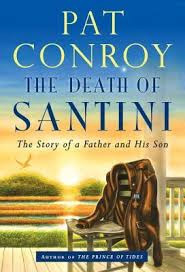 The Death of Santini – which is Conroy’s non-fiction account of his father and family – actually gave me a better appreciation for his related work of fiction. In addition to the insights about his family, I loved the stories about the writing & publishing of the book along with the filming & launching of the movie. There were moments when I felt like Conroy was using this book to have a final say in some unfinished conflicts, but when you’re selling books, that’s your prerogative. Fans of Conroy’s will enjoy The Death of Santini and the insiders glimpse it provides to characters and scenes in all of Conroy’s works.